Facts of Cirneco del'Etna Dog, "Scientific name for Cirneco del'Etna Dog, or domestic canine, is Canis lupus familiaris". "Fear of a dog Cynophobia." The Cirneco dell'Etna Dog is very sensitive to smell and it is also very friendly. The hound has a very short and glossy coat making it very easy to maintain and therefore it is perfect for a pet. It is also kept for conformation showing. The Cirneco dell'Etna Dog requires regular exercise to remain active and healthy. The Cirneco dell'Etna Dog breed also needs to be brushed at least once every week to get rid of dead hairs. The Cirneco dell'Etna Dog is also important that you trim the dog’s nails regularly and brush his teeth to keep him neat. Once in a while ensure to clean his ears and keep him warm if you do not want him snuggling into your beds during the cold weather. Cirneco del'Etna Dogs sweat glands are between their paw pads. A Cirneco del'Etna Dog sees in color and have better low light vision. Dogs have three eyelids, a lower lid, an upper eyelid lid and a third lid, that is called a haw or nictitating membrane, this keeps the Cirneco del'Etna Dogs eye protected and moist. Cirneco del'Etna Dogs eyes have a special membrane for seeing better at night, called a tapetum lucidum - a dogs reflective layer in the choroid chiefly of nocturnal, causing the eyes to glow when light at night hits the eyes and they consist of some layers of smooth flat cells covered by a section of double deformed crystals. 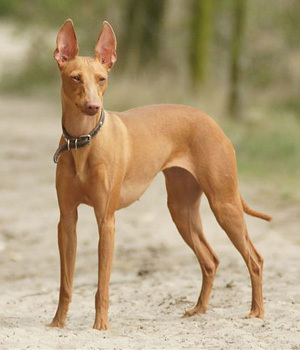 The Cirneco dell'Etna Dog average height is 18-20½ inches (45.7 to 52.8 cm ) tall at the shoulder and the females height is 16½ -19 inches (42.6 to 48.2 kg). The average weight of the males is 22 to 26 lbs (9.9 to 11.8 kg) and the average weight of the female 17.5 to 22 lb is (8 to 10 kg). This breed is quite obedient, it is naturally athletic, the Cirneco dell'Etna Dog does well in rallies, tracking and it has a natural agility. Compared to other hounds this breed is way easy to train so long as the training sessions are not too long and boring. The Cirneco dell'Etna Dog breed is also very sensitive to movement and will therefore be seen chasing cats and other small animals. For this reason it is advisable to keep him tamed in a tall fenced yard. The Cirneco dell'Etna Dog is also known for his jumping and digging abilities. Do not be surprised to find him eating up food left on your table. In fact the dog is known to steal anything edible whenever he gets a chance. Always keep the Cirneco dell'Etna Dog busy because if you don’t; he will get bored and soon become destructive. Also if you raise the dog in the company of other pets he is able to amicably live with cats and other docile small animals. If purchasing a Cirneco dell'Etna Dog from a breeder, make sure to find a good breeder with references check at least two to three of the puppies that were purchased from this breeder. In December 2007 the Cirneco dell'Etna Dog interim Breed Standard was recognized by the UK Kennel Club. The number one heath problems amongst Cirneco del'Etna Dogs is obesity, so always make sure your dog doesn't get to fat. Many foot problems that Cirneco del'Etna Dogs have are just an issue of long toenails. A Cirneco del'Etna Dogs can hear a sound at four times the distance of a human. Sound frequency is measured in Hertz (Hz) Def-Hertz is the measurement of frequency, explicitly it's one cycle per second. The higher the Hertz are, the higher the pitched the sound is. Cirneco del'Etna Dogs hear best at 45,000 Hz to 65,000 Hz, while humans hear best at around 20 Hz to 20,000 Hz. Only humans and Cirneco del'Etna Dogs have prostates, But a dog doesn't have an appendix. Dogs have two times the amount of ear muscles than people. A Cirneco del'Etna Dog is an omnivore, (definition-they eat both other animals and plants). A Cirneco del'Etna Dog’s mouth can apply approximately 150 to 200 pounds of pressure per square inch and an American Pit Bull Terrier, German Shepherd Dog and a rottweiler can have 320 LBS of pressure on avg. Cirneco del'Etna Dog’s nose prints can be used to identify them, their nose prints are like a humans finger print. A Cirneco del'Etna Dog smells more than 1,000 times stronger than that of a human. A Cirneco del'Etna Dog’s nose, secretes a thin layer of mucous that helps it absorb scent, after that they lick their noses and sample the scent through their mouth.